Mustaches of the Nineteenth Century: Amazing Facespanner! This gentleman is pushing the structural integrity of his mustache to its very limits. From the perfect bird-on-wing swoop to its stunning density, this mustache is easily the finest example of this rare and difficult style I have ever found. Sweet Jesus! How can he walk through doors? heavens! it rivals the amount of hair on top of his head! 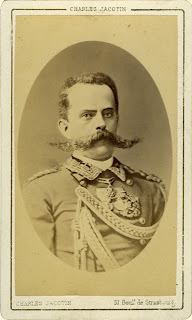 Wow, that is quite a mustache. What a great photo. For the holidays he'd often be seen gamboling up the streets of Chicago with holiday ornaments of angels and seraphim hanging from his mustache. This man must have spent his entire adult life stopping conversations mid word, causing accidents galore and no doubt encoountered more than a few slack jawed individuals. I hope some of those metals are for his prodigious mustache cultivation. Wow. Mustache on steroids. Having just been introduced to this site, I'm finding it extremely dangerous and detrimental to my productivity. Keep it coming!